Covering of the brain and spinal cord (meningitis): Meningitis can cause deafness and brain damage, and it can be fatal. About 18,000 older adults die each year from pneumococcal disease in the Unites States. • People sometimes faint after a medical procedure, including vaccination. Sitting or lying down for about 15 minutes can help prevent fainting, and injuries caused by a fall. Tell your doctor if you feel dizzy, or have vision changes or ringing in the ears. • Some people get severe pain in the shoulder and have difficulty moving the arm where a shot was given. This happens very rarely. • Any medication can cause a severe allergic reaction. Such reactions from a vaccine are very rare, estimated at about 1 in a million doses, and would happen within a few minutes to a few hours after the vaccination. If you think it is a severe allergic reaction or other emergency that can't wait, call 9-1-1 or get to the nearest hospital. Otherwise, call your doctor. • Ask your doctor. He or she can give you the vaccine package insert or suggest other sources of information. • Call your local or state health department. Vaccine information statement: Pneumococcal polysaccharide vaccine. Centers for Disease Control and Prevention Web site. www.cdc.gov/vaccines/hcp/vis/vis-statements/ppv.pdf. Accessed April 28, 2015. 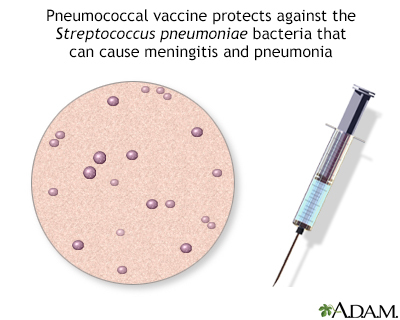 Pneumococcal vaccine is an immunization against Streptococcus pneumoniae, a bacterium that frequently causes meningitis and pneumonia in the elderly, and people with chronic illnesses. Pneumococcal pneumonia accounts for 10 to 25% of all pneumonias. Reviewed By: David Zieve, MD, MHA, Isla Ogilvie, PhD, and the A.D.A.M. Editorial team.